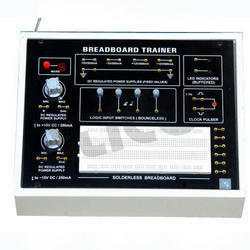 Exporter of a wide range of products which include bread board trainer and descrete component trainer. Output D.C. Voltage Fixed 5V +-1%. Output D.C. Voltage Fixed 15V +-1%. Load Regulation +-1% of the highest specified output voltage. Ripple And Noise less than 5 mV. Clock Pulses 1 Hz and 1 KHz by manual pulser. 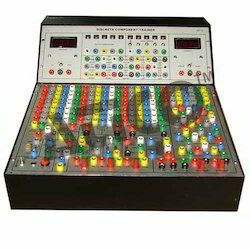 Logic Inputs 8 switches for High/Low. Bread Board 3 mains strips (Approx. 175mm long). 5 bus mains strips (Approx. 175mm long). For Connections 1/2 mains strip (Approx. 175mm long). Operating Conditions 0 to 40 DegreeC and 95% R.H. at 40 DegreeC. Input Voltage 230 V +-10% at 50 Hz A.C. Mains. 1. + 5V / 250mA. 2. + 12V / 250mA. 3. - 12V / 250mA. 4. 0 - 30V / 1A variable. 5. 0 - 70V / 50mA variable. 4 All the power supplies are regulated and short circuit protected. 3 Load Regulation : 1 % ( No load to Full load ). 3 Line Regulation : 1 % (for + 10% variation in line voltage ). 3 Ripple : < 12 mV rms. Looking for Bread Board Trainers ?